It’s been five years since members of the Six Nations began their protest and occupation at the site of the Douglas Creek Estates housing development in Caledonia. The events at Caledonia garnered national attention and caused heated confrontations between both sides. Five years later the land is vacant expect for one finished house, a burnt-out tractor trailer and Haudenosaunee flags, remnants of the Six Nations occupation. The Ontario Government has purchased the land from the housing developer and provided financial assistance to residents of Caledonia affected by the protest and occupation. A few weeks ago the University of Waterloo was the site of a very different talk. Professor Roger Epp, a political studies professor from the University of Alberta, gave two public lectures at the University of Waterloo’s Conrad Grebel College. Epp talked about his book, We Are All Treaty People: Prairie Essays, which addresses settler-aboriginal relations in the prairies. Yet for people like myself, living in the Grand River Valley, Epp’s assertion that “we are all treaty people, by inheritance, by virtue of living where we do,” has a contemporary meaning and resonance. “For ever” lasted only 57 years. By 1841 the Six Nations’ lands had been diminished from approximately 950,000 acres to 46,000 acres, less than 5% of the original Haldimand Tract, as they were relocated to the site of the present-day Six Nations Reserve. Local histories are vague as to why and how this happened. Brantford: Grand River Crossing by Janet Kempster and Gary Muir, explain the formation of the town plot of Brantford from Six Nations’ land in 1830: “Conscious that they occupied Indian territory, and uncertain of the legalities of their land transactions, the settlers managed to obtain formal titles for their properties from the authorities. Furthermore, the Six Nations Indians were induced to surrender 807 acres to the Crown as a town plot.” (p.26) Local history in Brantford tends to downplay, if not ignore the settler-aboriginal story. The Brant Museum and Archives is the local museum in Brantford housed in a Victorian home. The museum has been open since the 1890s, and the majority of its exhibits and artifacts reflect life in late 19th century Brantford. There is little mention of the Six Nations or the Haldimand Tract. 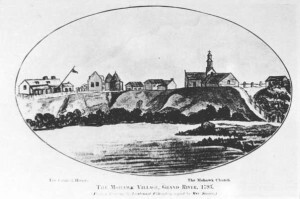 Brantford is also home to two other local history sites that present a very different view of Brantford’s history: the Woodland Cultural Centre and the Mohawk Chapel. The Woodland Cultural Centre is situated on the site of the Mohawk Institute, a residential school that operated from 1828 to 1970. Since 1972 the Woodland Cultural Centre has served as a First Nations’ educational and cultural centre. Just down the road from the Woodland Cultural Centre is the Mohawk Chapel. Built in 1785 the Mohawk Chapel is the oldest Protestant church in Ontario, and is the only remaining building from the original Mohawk Village on the Grand. But the history presented at the Woodland Cultural Centre and the Mohawk Chapel appears to run parallel to that of the Brant Museum and Archives, what Epp calls the two solitudes of settler and aboriginal communities. Brantford is a mere 25 km from the centre of the Six Nations Reserve, but the two seem worlds apart. 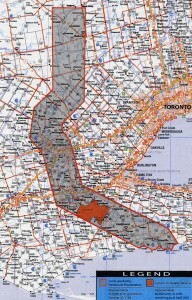 While many living today in the Haldimand Tract would like to keep it this way, with little or no reference to the history of settler-aboriginal relations in the Grand River Valley, the on-going land dispute in Caledonia brings this very history to the forefront. The Caledonia land dispute is one of 28 outstanding land claims filed by the Six Nations against the Government of Canada between the early 1980s and the mid-1990s. The Douglas Creek Estates property in Caledonia is part of the Plank Road/Port Dover Claim originally filed in 1987. These claims document the alienation and erosion of the Six Nations’ lands in the Grand River Valley through the actions of white squatters, dubious land sales and titles, and the unscrupulous actions of the Six Nations’ government-appointed trustees. According to the Six Nations these 28 outstanding land claims represent hundreds of billions of dollars. But the Canadian Government has set a limit of $150 million for specific land claims. The Six Nations recognizes that the Canadian Government cannot financially settle their land claims, and instead calls on the Canadian Government to uphold the spirit of the treaties to provide for the “perpetual care and maintenance” of the Six Nations. Today, there is very little progress being made towards the settlement of the Six Nations’ land claims in the Haldimand Tract. From living in the Haldimand Tract, working in Brantford, and visiting the Six Nations Reserve, the history of settler-aboriginal relations in the Grand River Valley resonates in my everyday present life. It is a history that not only informs our present but needs to be reconciled with our present and future. I now understand that I am a treaty person. 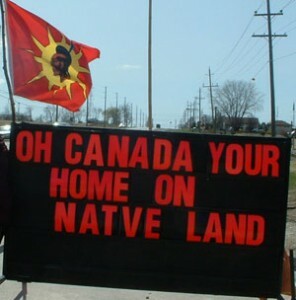 But we as Canadians, inside and outside of the Haldimand Tract, need to recognize that we are all treaty people. I have a story to tell. I am Metis with Treaty Status. I was forced to attend Indian Residential School in Prince Albert, Saskatchewan, 1962-1967. I did not find out my ancestor was the Father of Canada until last year while on holidays when we discovered documents at Fort William archives in Thunder Bay, Ontario. He had twin Metis sons – as you will see in my blog. Thank you for your comment and sharing your story. I would like to read the real documents from both sides because one thing is certain there is three sides to every story and I don’t trust either side enough to take there words for it. What I thought was the case, and I suspect most Canadians also think, is that most Native land treaties are done deals, legally defined, and honoured. I am surprised this isn’t the case and there is a problem regarding boundaries of Native lands that needs to be addressed. I had heard the story of the Haldimand Tract, but the version I had heard also said Joseph Brant sold off large tracts to Scottish and Mennonite settlers. And now this may not be true? Surely something like this can be proven with documentation. I remember Oka and wondered how that could possibly happen in Canada – I thought it surely was a matter of misplaced survey stakes or a one-time misunderstanding on territorial borders, not one of many issues that disregards Native land claims. this has to be a priority to sort out.